He’s now running on creating a public bank and refinancing student loans. 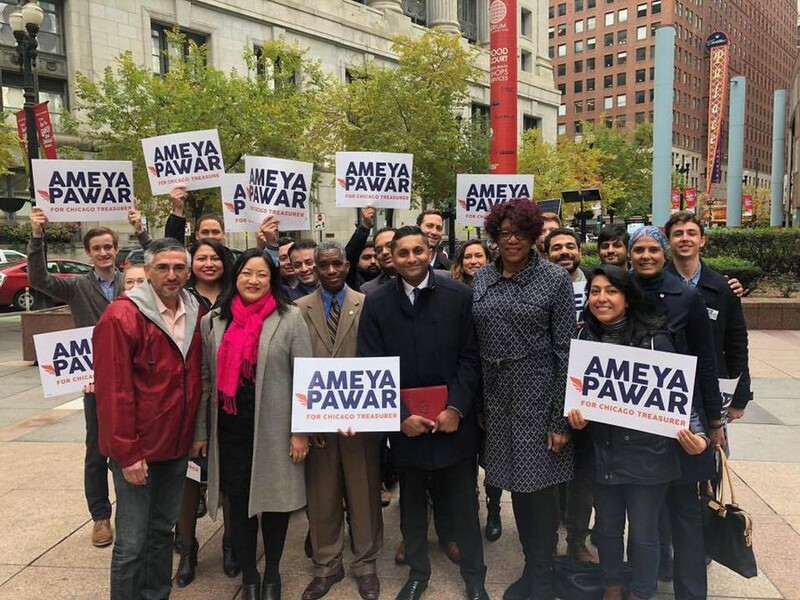 47th Ward Alderman Ameya Pawar (S.M. ’09, A.M. ’16) is a familiar face in Chicago politics and, this quarter, is on campus as an Institute of Politics (IOP) fellow. After incumbent Chicago City Treasurer Kurt Summers announced last month that he is not running for reelection, Pawar quickly jumped in, announcing his bid for treasurer last Sunday. Pawar had an unsuccessful bid for the Democratic gubernatorial nomination late last year. He ultimately dropped out due to insufficient funds and backed the Democratic nominee, governor-elect J.B. Pritzker. The Maroon sat down with him to talk to him about his experiences and candidacy. Pawar said his education and experience as alderman align with the responsibilities of treasurer. He received a master’s in threat response and management from UChicago’s Graham School in 2009. His IOP seminars this quarter have centered on how the degree has influenced his use of disaster response to address social issues. As alderman, Pawar spearheaded legislation that guaranteed paid sick leave, raised the minimum wage, and combated wage theft. He also helped create the city’s independent budget office—the fourth of its kind in the nation. This September, after Pawar introduced a resolution calling for a city program that would pay 1,000 families $500 per month, Mayor Rahm Emanuel appointed him to a task force that will consider whether to implement universal basic income in Chicago. “I’ve got almost eight years of experience working in Chicago City Council passing budgets, working on complex financial issues, in addition to making tough decisions to right the city’s financial ship and passing legislation—building coalitions to get big things done for working people,” he said of his aldermanic experiences. His methods to generate those returns center around establishing a public bank and refinancing student debt. Pawar said that were he elected, he would limit his tenure to two terms, as a personal choice and not as something he wished to see legislated. Like the mayor, the city’s treasurer does not have term limits. “I know that when I'm given a certain amount of time to work on something, I am going to give everything I have, all day, every day,” he said. Among his most ambitious targets for a potential two-term tenure is creating a public bank. Public banks are government-run financial institutions which use their city or state’s direct investment and leverage tax revenue for direct investment. The Bank of North Dakota is the only current example of a public bank in the United States. Since its establishment in 1919 with an initial $2 million investment, the bank has grown to support economic development in the state by working across North Dakota’s government and with financial institutions. As of 2016, it held over $7.2 billion dollars in assets. Pawar hopes to establish a similar institution in Chicago. He hopes his plans to implement a student debt refinancing program will help fuel the public bank. Under the refinancing program, an individual would pay back their student loans at a lower rate in exchange for 15 years of residency in Chicago. Pawar believes this refinancing would generate disposable incomes that would then go back into communities. Maine implemented a similar type of incentive in 2008. Under the Education Opportunity Tax Credit program, college graduates who move to Maine can put their loan payments toward tax credits. While Pawar’s proposed program isn’t based on exchanging payments for tax credits, he said that it could possibly combat the city’s population decline issue. Pawar believes that such programs will allow him to accomplish what he views to be the city treasurer’s main goal of generating returns. “First and foremost, the goal is to protect the city dollars and to generate healthy returns both for the pension funds and for city-based investments,” he said. Pawar said he is optimistic about getting the 12,500 signatures needed by November 26 to get on the ballot. He said his race for governor “was a very grassroots-driven campaign, and I think that’s what we’re going to do here."